* “Most blessed are you among women and blessed is the fruit of your womb” is a major Scripture quote from this brief story. 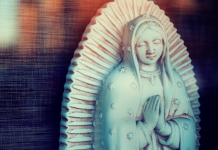 * The fact that John the Baptist, in his mother’s womb, “leaps” at the presence of Jesus is of utmost importance in the Church’s pro-life position. * Mary hurrying to help her kinswoman is a model of charitable thoughtfulness and courtesy. 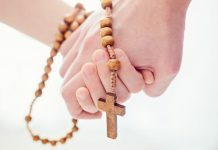 * The date of the feast is an open invitation for us to use as the children leave for summer vacation and the various “visitations” that await them, if only we can raise their awareness. First, the students need to know the story. Mary is very young—perhaps only 13 or 14 years old. Elizabeth is elderly, six-months pregnant, with a husband who needs help because he cannot speak. She lives far away in the hill country. Both women want to share their miraculous good news. Mary’s small town of Nazareth has only about 150 people—and gossipers will soon be at work. Elizabeth’s husband is an official in the synagogue—where there has already been gossip. 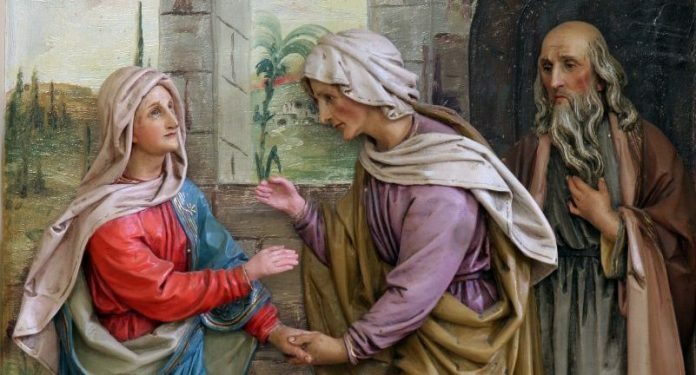 Maybe Elizabeth can give her younger cousin some advice about practical womanly things, while the younger Mary might offer a strong pair of extra hands. 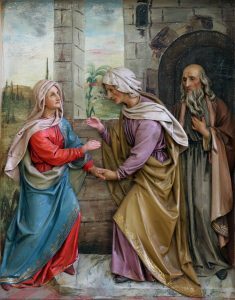 Mary spends three months helping in Elizabeth’s household before she goes back to Nazareth. Second, the children need to anticipate their own summer “stories.” Are they likely to be visiting grandparents or older relatives near or far? What about cousins or friends their own age? Perhaps they’ll make new acquaintances at camp or summer school? Each contact can be seen as a “visit,” a way of showing God’s grace to his people. No one is too young to spread God’s grace. The virtue of courtesy is never out of date. It would be nice to think we don’t need to teach it directly, but we better not miss the chance when we have it! According to the age of your group, discuss some specific situations students may encounter over the summer in their “visitations.” Then review with them some simple DOs and DON’Ts that they might keep in mind, knowing the children will respond better when we bring up these points in informal discussions about their plans. Do pleasantly greet people who come to visit and spend time in conversation with them. Do compliment things you honestly like. Do pay special attention to anyone who is speaking, listening attentively and politely. Do play with younger cousins and be a good role model. Do reach out to new kids in your group or anyone who is shy. Do say thank you as you leave and maybe make a follow-up phone call in a day or two to say thank you again. Don’t dash past Grandma without a word and bury your nose in an electronic gadget. Don’t make rude comments about foods you dislike. Don’t talk about others behind their backs. Don’t disobey “house rules” in the homes of others. Kindness and courtesy are contagious, so maybe the kids will have interesting reports when they come back next fall! 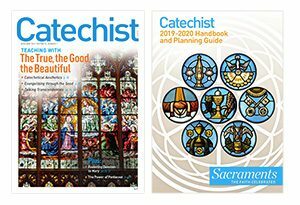 Page McKean Zyromski, a catechist for 45 years, has been a long-time contributor to Catechist. She lives in Painesville, OH.